PhonePe App Review: Your Next Digital Wallet. Demonetization is a word which has been the talking point for about the past month in our country. But if you flip the coin, isn’t there a need to eradicate that old, usual transaction method and go paperless? Even though there might be a major issue replacing the old notes, there are many ways in which one can utilize their money for the things they need to buy. The primary solution, and another talking point presently, is digital payments. So today let's find out how PhonePe could be your next digital wallet with its robust & secure online payment services. So PhonePe is a digital payment platform built specifically for mobile devices. Presently, only the Android version is available, but the iOS version is also expected to hit the market soon. With a host of features, including PhonePe's trademark "Unified Payments Interface (UPI) which allows direct bank-to-bank transfers with only the recipient’s mobile number," this app helps you in connecting your bank account to your app for wallet payments. Speaking of which, PhonePe stands in the league of the trusted and secure digital payment platforms in the country, when compared to several other E-Wallet platforms. So let's understand everything behind the app in-depth and the services they offer which are unique and most necessary considering Demonetization in our country. MPIN Feature: It's like adding an extra sheet of security on each of your transactions, as without MPIN, the transaction wouldn't take place. Consider it as a replica of ATM Pin, whereas just like the ATM Pin, You shouldn't share your MPIN to anyone. The MPIN Feature is a part of PhonePe's UPI system, where one can perform online transactions using a VPA (Virtual Payment Address). It lets you pay both online and offline merchants directly from your bank account without the need of your debit/credit card, OTP or your IFSC code. Whereas the other party doesn't receive any of your information, which is why everything is secure. Direct Bank to Bank secure transfers: Here PhonePe uses there secure "Unified Payment Interface" which is supported by the Government of India. While as it's built on IMPS which is immediate payment service, This service allows one to transfer money between any two following bank accounts by simply using your mobile number or by using a VPA(Virtual Payment Address). Both of these actions are very useful as they don't provide any of your bank information to the third party. So next time you want to transfer money from one bank to another, just enter the particular person's phone number or VPA, and the next moment you know that the amount had been transferred to their bank account immediately. Let's say if you don't have UPI activated on your bank account; You cannot receive payments on your Bank account. Though you can get those refunds via Flipkart or Myntra, mostly adding up that money in you PhonePe account. Even if you ran out of Wallet Balance on your PhonePe account, don’t worry you can rather use your Bank account to process transactions which can be done by a reg mobile number or VPA. 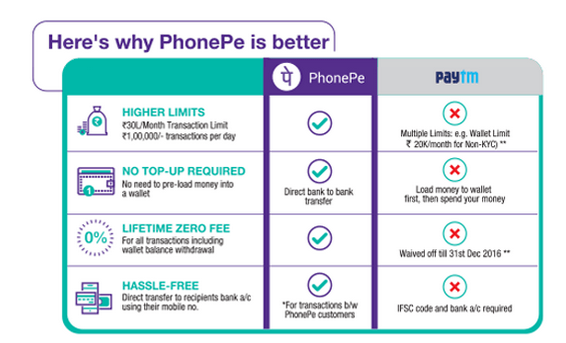 So don't worry if you ran out of your wallet balance, because PhonePe's services have got you covered. So after having a PhonePe account, one can utilize that to pay his/her Postpaid, DTH, Data card bills, etc. You can also send as well as receive money from your friends, family, etc. You can even split your bills with your friends during the payment itself. Scanning a particular QR code to send the money also works perfectly fine. Whereas there are no hidden charges for performing any of those actions. Whereas if you return your product to Flipkart, Your refund would get initiated in your PhonePe account. 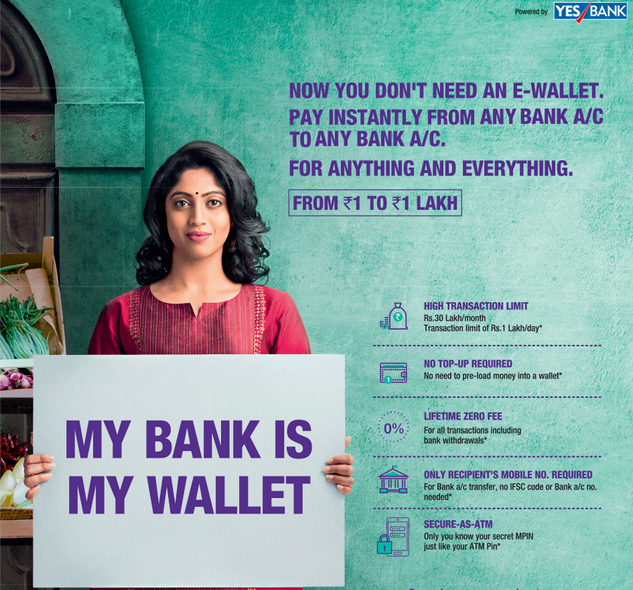 Yes Bank powers PhonePe's services and which is why everything is 100% secure as claimed by the company. While all the payment transactions take place without letting the third party have any information or the Bank having any passwords or additional info on the same. Even if you want to withdraw the wallet money back to your Bank account, there are no extra charges for the same. Are there any exclusive benefits for PhonePe users compared to other E-wallets? Here you get higher transaction limits which are 30L/month when compared to 20K for wallets. Whereas there's no urgency to add money to your wallet as the bank amount is directly used to perform a transaction. After the demonetization had occurred, mostly the withdrawal amounts were decreased offline. But if you think of online transactions, you can spend up to 1 lakh per transaction. Whereas there are no worries regarding your account safety, Even if you've performed one transaction within two years, as your account would be still up and running. Since it's exclusively available on Android, Head over to Google Play store and download PhonePe app. Once installed, Open the PhonePe app and enter your mobile number for initiating the registration process. Also keep in mind to enter the phone number, which gets linked to your bank account. Start entering your Name, E-mail Address and set your 4-digit password for activating your wallet account. Then head over to ‘Create New VPA,' followed by linking your bank account by tapping your bank, as the app is smart enough to auto fill those details. Once confirmed with all the correct inputs, You're all set to use PhonePe's services. PhonePe App Review: Final Verdict. Since PhonePe is now a part of Flipkart, their major target is to promote the use of online digital wallets and reduce the old cash-based transactions. Whereas according to some surveys conducted by Google, They think that India will have an increase in digital payments ecosystem. The digital payments industry will reach the mark of $500 billion by the year 2020. So Cashless transactions are the future, so why not be a part of it at the forefront? The PhonePe app has been downloaded over 5 lakh times from Google Play store, Whereas you can get up to Rs.100 off on your first UPI transaction. So that's about it guys, If you've any queries let us know in the comments section below.